As part of my move to more natural products, I strongly suspected there would be one significant challenge. Deodorant. I’ve had my daily dose of deodorant since the need for them hit as a teen, perfectly happy with the fact I didn’t smell, until I learnt a bit more about just what those chemicals do. Green People Natural Deodorant was my first attempt at something more natural. First impression is that it smells ok, despite making me smell of pine. I wasn’t quite sure how I felt smelling lightly of forest. Second impression is that despite being in very moderate temperatures and never really considering myself to be a ‘heavy sweater’ (never written that before), this really didn’t hold up. At all. I was prepared for the underarm situation to be a little, erm, damper, without my industrial strength antiperspirant. However, that underarm situation quickly descended into a bit of a funk. By quickly, I mean by lunchtime in an air conditioned office. This has never happened to me before. I genuinely believed that I smelt fine with or without deodorant, I just wore it for fun. I gave this a good go. I spent a whole month trying it out, but the vast majority of the time I was impersonating a T-Rex after 12pm, all awkward but determined to pin my upper arms to my body. It also made me paranoid. Was every one talking about the fact I smelt funny? When I found myself walking more slowly indoors in fear of drafts worsening the problem, I realised that this wasn’t the deodorant for me. Despite growing very fond of pine during this trial, my search for a good natural deodorant goes on. 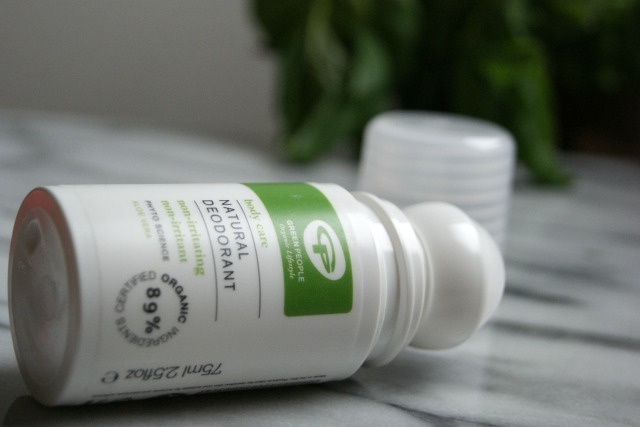 As always, I love to read your comments, if you have found a natural deodorant works, please let me know!